Certainly the theme [in general] is extremely important, even if I personally have always considered it of little significance. For this reason, especially in the first films of Leone but also … on many occasions afterward, I have attempted to distinguish it, to subtract it from its conventional function. In some cases I have augmented the result with timbre, in others with the pursuit of a theme made of intervals. Like the other major themes in Once Upon a Time in the West, much of the impact of “Man with a Harmonica” stems from its colourful use of musical timbres. The cue opens with a solo on the harmonica, itself an unusual instrument for film scores of the time. But this opening gradually builds to the theme proper, which is announced with the aggressive sound of a type of electric guitar called a Fender Stratocaster. It is not merely the inclusion of these instruments that contributes to the unique sound of this cue but, more importantly, their combination with those of the traditional orchestra and, in the cue’s middle section, even a wordless choir. Morricone’s non-film works form a large and increasingly widely performed part of his output. Many of them use his technique of “micro-cells”, a pseudo-serial approach often incorporating modal and tonal allusions, which, with its extreme reduction of compositional materials, has much in common with his film-music techniques. If an interval describes the relationship between only two notes, we might define a micro-cell as going a step further and incorporating three notes. The difference between a micro-cell and a more traditional motif is that the micro-cell has no set rhythm, nor a prescribed order of its pitches. What remains constant is the relationships among the three notes, or more simply, the intervals they form with one another, which may occur right-side-up or upside-down (inverted). This technique has more in common with twentieth-century modernist music than film music, but Morricone imports it into his eclectic film music style, which is why Miceli describes it as a “pseudo-serial” approach (serial referring to twelve-tone music). The second phrase (at 1:18) begins with a prominent octave leap, which we might regard as a kind of enhanced repetition of a pitch. 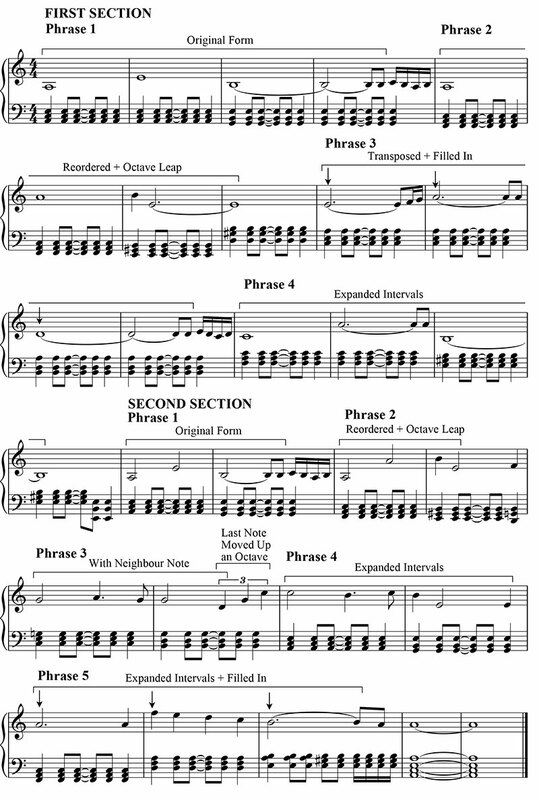 After all, in musical notation, all notes that are one or more octaves apart have the same letter name, suggesting that an octave leap represents another version of the same pitch (an idea called “octave equivalence”). In the theme, the intervals after the octave leap are a major second and a perfect fifth, forming another statement of the micro-cell. The perfect fourth, which may seem to be missing, occurs between the first and last notes of this micro-cell, A-E. Notice that the notes stated here, A-B-E, are a rearranged form of those in the initial micro-cell, A-E-B. Hence it is easy to hear how these phrases belong together as two forms of the same idea. Even the third phrase (at 1:30) outlines a perfect fourth (now filled in with stepwise motion) and a perfect fifth, and the first and last notes span the micro-cell’s major second. In this case, the cell is also transposed, so the original A-E-B becomes E-A-D. Again, notice how the order of intervals are rearranged from the previous two statements: the first began with the perfect fifth, the second with a major second, and the third with the perfect fourth. It is almost as though Morricone is systematically shifting the micro-cell to keep it sounding fresh with each statement. The fourth and final phrase of the theme’s first section (at 1:42) gives yet another statement of the micro-cell, only now the intervals of the fourth and fifth have been stretched by a step to reach a fifth and a sixth. Again, the phrase sounds cogently tied to what preceded it but with a new twist that allows larger, more dramatic intervals to conclude the theme’s first section in a musically satisfying way. The first two phrases of the second section (at 1:54 and 2:01) begin like those of the first, but with the rhythms of the micro-cell now accelerated to twice their original speed. This gives a clear indication of a rise in tension here, a feeling augmented by Morricone’s addition of a fuller orchestration involving violins on the melody, entrance of the wordless choir, a militaristic rhythm hammered out by bass and snare drum, and numerous expressive dissonances in the inner voices created by the use of suspensions. At the third phrase of the section (at 2:07), the music breaks out into a new use of the micro-cell, marked by a striking modulation to a new key (C major). Here, the cell is employed with more flexibility as the initial note is returned to before stating the third note. (This figure of moving stepwise to a note then returning back to the original is called a neighbour note, and is an extremely common melodic device in Morricone. Of course, such a simple figure is common in all tonal music, but it occurs with particular frequency in Morricone’s music, and hence can be considered one of his signature melodic devices). The fourth phrase (at 2:14) uses a similar neighbour note, but now in the opposite direction. Notice that even the innocuous three-note lead-in to the fourth phrase (at 2:13-2:14) also states the micro-cell, though now with its last note (C) shifted to a higher octave. Had this C been set an octave lower, we would have had a version of the cell that we have already heard (in the third phrase of the first section). Once again, Morricone ensures we do not tire of so simple a melodic cell by endlessly varying its statements. Finally, the diminished fifth of the theme, which is the last interval of the micro-cell, is now filled in with gradually descending steps, as though moving towards an inevitable outcome. Musically, that outcome is the arrival of the final note of the theme proper, the tonic note of its key of A minor, which signifies resolution. Appropriately, this resolution is coordinated with the moment we first see Frank’s face in the film, which, in one of the most stunning instances of anti-type-casting in all of cinema, reveals the bad guy to be none other than Henry Fonda, the beloved hero of countless American western films. In “Man with a Harmonica”, the sense of mystery is enhanced not only by the rhythmically free setting of the solo harmonica line, which does not suggest any sort of meter, but also by the heavy reverberation effect, which obscures the sound and gives it the impression of approaching from the distance, much like Harmonica’s blurry flashbacks in the film. When instruments of the orchestra enter the cue, the three-note figure E-C-D# associated with Harmonica is repeated in a straight rhythm to become an ostinato. This regular repetition of notes clarifies the pulse of the cue but not yet its meter, which is hinted at by the long bass notes and finally confirmed with the entrance of the electric guitar. Once again, like Harmonica’s flashbacks in the film, the substance of this theme only gradually comes into focus as it proceeds. The first two phrases of the theme’s opening section are built on a bass line that begins on the tonic A and falls three steps to its dominant, E. When set in a minor key as it is here, this four-note pattern is referred to as a lament bass, because of its long association in classical music with expressions of grief and despair. 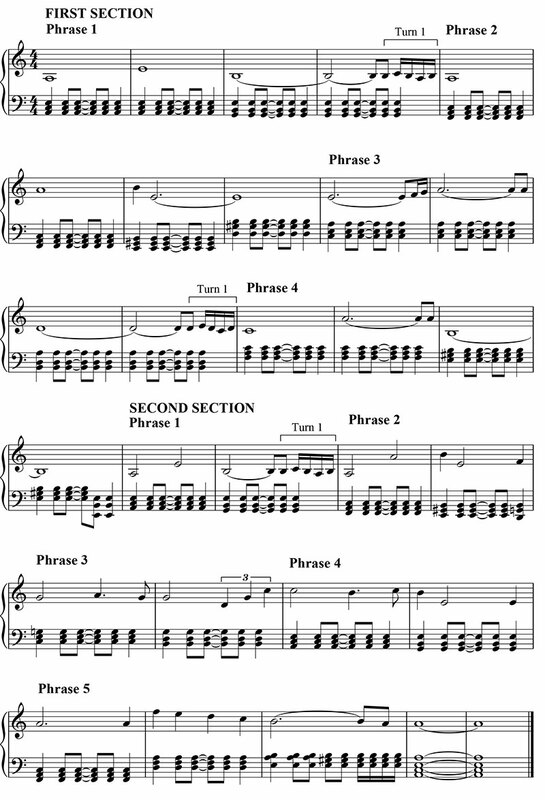 While Morricone does not employ the lament bass specifically in many of his film cues, its first three notes, descending by step from the tonic, recall the first three bass notes of the plagal thirds progression, which underlies the beginning of Jill’s theme and the B section of Cheyenne’s theme. The chords involved in Morricone’s setting of the lament bass move from the minor tonic down to the dominant chord in the progression i-v6-VI-V, the first three of which are essentially the same as those of the plagal thirds progression.Thus, all three of the major themes in the film share a common musical element that helps to identify Morricone’s style despite the drastically different emotions each theme conveys. Through this three-part series on Ennio Morricone’s classic score for Once Upon a Time in the West, we have seen that the composer’s highly recognizable style relies on the repetition of a relatively small number of musical techniques. Melodically, there is the use of the turn figure, the anticipation, and themes “made of intervals” such as the sixth in Jill’s theme, the unison in Cheyenne’s theme, and the combination of fifth, fourth, and second in the “micro-cell” of the Frank/Harmonica theme. Harmonically, Morricone often draws on the simple primary progression of I-IV-V-I (as in Jill’s theme), the Dorian mode (as in Cheyenne’s theme), the plagal thirds progression of I-vi-IV-I (as in both Jill’s and Cheyenne’s theme) and the closely related lament bass, which supports chords similar to the plagal thirds. And of course, the use of unusual timbres in the orchestration is another key aspect of Morricone’s style, one that, in combination with the other stylistic elements, remains a distinctive trait. In all of these ways, Morricone has succeeded in creating a style that not only remains identifiable as a compositional fingerprint, but that also fulfills the expressive needs of a film in a manner that is at once effective, memorable, and unique in the history of film scores. Thank you for another interesting essay on Morricone’s music. I hope you can find some time and inspiration to analyse some of his other Western scores with Leone. While there is a Filmscore Guide on The Good, the Bad and the Ugly; I have not seen any kind of analysis of “For a few dollars more”, which is my favourite part of the Leone/Morricone Dollar-Trilogy. This is wonderful Mark – so interesting. I’ll get to the piano and play some of these sections of your analysis. The extraordinary thing about Morricone is his versatility- no two scores sound the same. Whether it be these Sergio Leonie westerns, Tornatore’s “Cinema Paradiso” or de Palma’s “The Untouchables”, this music represents the very best of the art and I thank you for your intensive analysis of “Once Upon a Time in the West”. Curiously, I’ve never regarded these films as terribly visually interesting because they remind me too much of the ‘zoom in/zoom out’ aesthetic so much a part of 60’s and 70’s films. The music raises the stakes, though!! Another example of the parts of a film being better than its sum! Something interesting to mention also with the ostinato is that, based on a triplet rythm (3/4 I suppose) when the first section enters, this create an interesting polyrythhm between the guitar melody (4 beats) and the continuing ostinato played by strings (3 beats). I’m sure there would be a lot to say about Morricone use of rythm and he surely has a couple of common tricks in that field too!